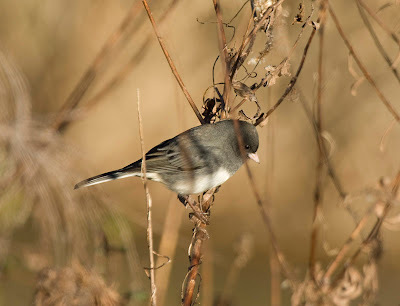 We decided that our first stop in the afternoon should be in Greene-Sullivan State Forest to look for some of the woodland birds that had been missed during the morning. We made several unsuccessful stops along the road and then headed on to Reservoir 26. We split into two group and headed in opposite directions around the lake. While my group got little other than some Junco, the other group found the only Brown Thrasher on the whole count. 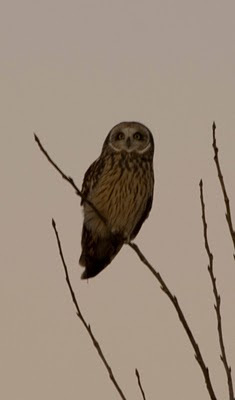 Since it was getting close to dusk, we headed over to Hawthorn Mine for the Short-eared Owl show. We quickly found both Rough-legged Hawks and Northern Harriers. After about 30 minutes of driving around, the first Short-eared Owl popped up from its roost in the grasses. After several minutes, there were a dozen or more owls in the air. Some of them perch close to the road and allow for amazing photography opportunities. Overall we had a fantastic day and 108 species were seen on the count, the most so far in Indiana this year. Look for my post tomorrow about how to win a trip to go birding in Peru. Please help me win this trip by following this link http://bit.ly/8s830C and signing up for the free newsletter about birding and conservation in Peru.